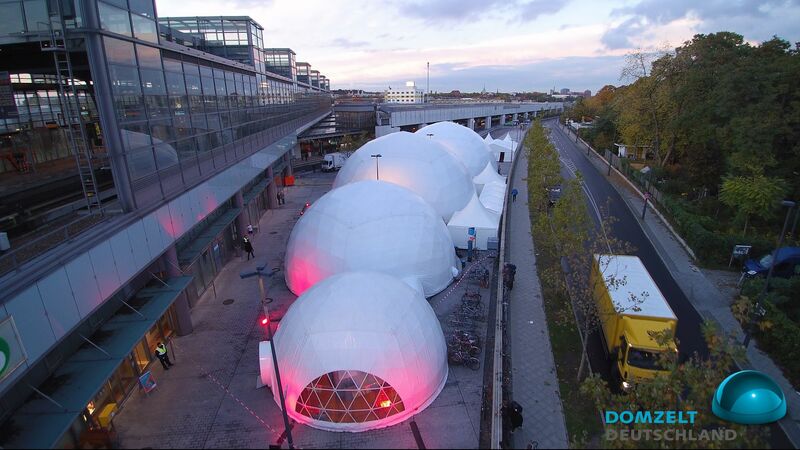 The dome can be supplied in diameters of 7 m, 10 m, 15 m, 18 m, 20 m, 25 m, 30 m and 35 m. The spectacular hemispherical lens is on the roofing market and in the tent industry currently represents the most innovative and most popular variant Our domes are covered with the white Tarpaulin, which merges visually harmonious with the delicate white frame. All domes are to be combined to create entire landscapes Dome. The design is characterized by an extreme wind stability, it can accommodate static loads such as lighting and sound variable and provides a great opportunity for individual equipment options.